Hello friends! Today I decided to share with you a recipe for lemon meringue pie, which does not put you weight but beautifies! And how does this can happen? Because I am talking about a soap that smells great and looks so realistic to lemon pie that it is difficult for everybody to tell the difference! It also has a delicious fragrance of lemon freshness and impressive appearance, a lemon pie that can be a special gift. 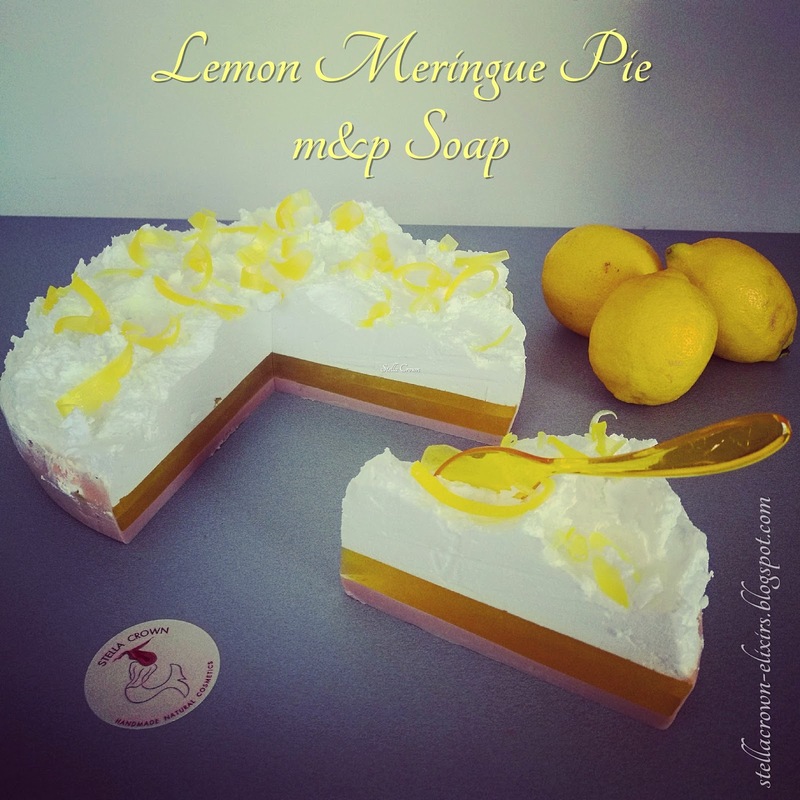 Special guest: usually I like to add oils and butters in my m&p soaps, so this time I used a handmade lemon infused oil, a gift from my friend Litsa, in order to give a distinct, rejuvenating scent of freshly cut fruit, a high aromatic note. Before you start making the soap, sanitise tools, containers and work surface. Wear your gloves. Weigh the soap bases, cut them into cubes and leave them aside. For the base (crust): pour the soap cubes and the coconut oiling the beaker. Place the soap in microwave and melt for 10 seconds. Stir and melt for 10 seconds again. Repeat the process until your soap is completely melted. This technique prevents the soap from scorching. Add the lemon infused oil and the essential oil and stir again. Add now the colouring carefully until you find the shade you want and stir thoroughly. Spay with rubbing alcohol into the soap and the pie pan. Pour the soap into the pan and spray again in order to remove the bubbles. Allow the soap to cool and harden. For the pie filling: follow the same process to melt the soap. Once the temperature of the pie filling soap reaches 60 degrees Celsius, spray with rubbing alcohol very well the soap base into the pie pan, to make sure that the layers will stick together. Pour the pie filling and spray again with alcohol to remove the bubbles. Allow the soap to cool and harden. For the lemon slices: melt the soap base, add the colouring and stir. Pour the soap in a paper plate and allow to harden. Cut into slices by using a butter knife. For the frosting (meringue): melt the soap with the 10 second bursts techique and pour it into a stables bowl. Add the all the other ingredients and the half of the water. Stir thoroughly with the mixer and when the soap starts to stick on the mixer blades, add the rest of the water. Mix again well. Spray with alcohol into the pie pan and spread the meringue on the top of the soap, using a spatula. Spray again with alcohol and use the lemon slices to decorate the top of the lemon meringue pie soap. Cut the pie into slices and enjoy!